Everton XI: Robles, Coleman, Stones, Funes Mori, Oviedo, Besic, Gibson, Osman, Deulofeu, Kone, Mirallas. Southampton XI: Forster, Martina, Van Dijk, Fonte, Bertrand, Wanyama, Clasie, Mane, Long, Tadic, Pelle. Neither side really threatened a winner in the last few minutes and there are a few boos as the referee blows for full time. Follow reaction to this game and the rest of Saturday's matches by clicking here. There'll be four minutes of added time at Goodison Park. Another Everton academy product makes his debut as Tom Davies comes on for Darron Gibson. "Everton can’t see games through. They are still sending bodies forward, so many points have been dropped from winning positions. It is not good enough"
Southampton are still looking the likeliest to nab a late winner. And they thought they had it a few moments ago, only to be denied by a sensational interception by Ramiro Funes Mori. Shane Long is through on the Everton goal and, instead of shooting pulls the ball back, but Funes Mori slides in to intercept before Jay Rodriguez can tap in. Everton are under all sorts of pressure. Everton's lead doesn't last long. Dusan Tadic runs into the box from the left and, after a bit of pinball as the home defence fail to clear, Sadio Mane sweeps in a shot. Southampton need a goal and manager Ronald Koeman brings on forward Jay Rodriguez for defensive midfielder Victor Wanyama. "Southampton have played really and Everton have hit them with the sucker punch. "Funes Mori attacks the ball well, he is a threat in the opposition penalty area." Talk about a goal against the run of play. An Everton corner finds its way to Ramiro Funes Mori and his initial header is blocked by Shane Long, whose attempted clearance sees him inadvertently play the ball back to the Everton defender. Funes Mori makes not mistake with his second chance as his left foot shot is deflected in off Ryan Bertrand. Everton boss Roberto Martinez takes off Gerard Delofeu for Ross Barkley as Southampton boss replaces striker Graziano Pelle with Steven Davis. 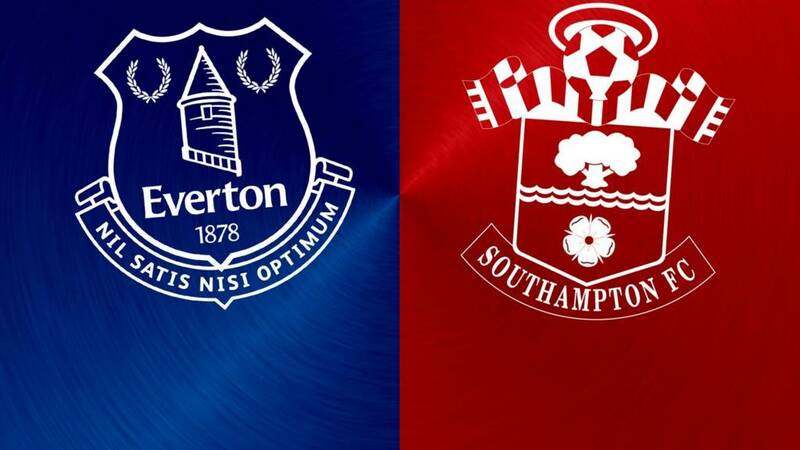 Everton have a free-kick in a decent position about 25 yards out but an effort from Kevin Mirallas goes straight into the arms of Southampton keeper Fraser Forster. Rather helpfully, Everton put a tweet out earlier about debutant Callum Connolly, who has come on for Seamus Coleman. With games against Liverpool and Manchester United in the next seven days, an injury to Seamus Coleman is not what Everton boss Roberto Martinez needed. Everton right-back Seamus Coleman makes a tackle but is left holding his hamstring afterwards and immediately signals to the bench. He goes off and is replaced by 18-year-old debutant Callum Connolly, who gets a massive cheer as he clears a corner with his first touch. The frame of Everton's goal comes to their rescue again. Dusan Tadic has a left-foot shot which beats keeper Joel Robles only to come off the crossbar. Southampton have started where they left off in the first half as they put pressure on the Everton defence. They win a free-kick but nothing comes of it as it's too close to keeper Joel Robles as he comfortably gathers. Southampton end the half with a succession of corners and the last sees Virgil van Dijk with a shot at goal from 15 yards but he stabs his effort over. Everton's goal was leading a charmed life before the referee blew for half-time. A Southampton corner is flicked on by Shane Long and it comes off the post to deny Sadio Mane getting a vital touch to divert the ball in.